Introduction: Our aim was to study dengue-related immune-mediated neurological complications (IMNC) during the recent epidemic. Materials and Methods: This was a cross-sectional observational study of 79 IMNC cases from 1627 laboratory confirmed dengue cases from January 2015 to January 2016 and their follow-up for 3 months. According to the World Health Organization, cases were categorized into those having dengue fever (DF), and those having a severe syndrome that includes dengue hemorrhagic fever (DHF) and dengue shock syndrome (DSS). Laboratory as well as clinicoradiological data, the predictors of outcome, and the role of immunomodulation in determining the final result were analyzed. Results: Out of the 1627 confirmed dengue cases, 14.6% developed neurological complications and only 4.86% cases had IMNC. Among the IMNC seen, the majority of the patients had the onset of their manifestations in the subacute (7–30 days) latency period; however, there was no mortality seen. We found Miller Fisher syndrome (MFS), limbic encephalitis, and immune-mediated cerebellar demyelination (IMCD) as the new findings in the IMNC spectrum. Patients with DF were more prone to developing brachial plexus neuritis and polyneuritis cranialis, whereas those patients with a severe syndrome were more commonly associated with Guillain–Barre syndrome (GBS). Significant (P < 0.001) predictors of central nervous system involvement were anemia, an elevated hematocrit, and the presence of DSS, whereas patients with a higher mean body temperature, DF, and elevated hematocrit were more prone to developing peripheral nervous system manifestations. The platelets counts and the hemoglobin levels had a negative correlation whereas the hematocrit value, the mean body temperature, and the alanine aminotransferase levels had a moderately significant positive correlation for the development of IMNC. The immunomodulatory therapy (IMT), if initiated after fever abatement led to a significant clinically favorable outcome at 3 months, especially in patients with GBS, polyneuritis cranialis, and brachial plexus neuritis. Conclusion: The spectrum of IMNC is vast and may include MFS, limbic encephalitis and IMCD. Early initiation of IMT, in the presence of significant predictors, may reduce the IMNC-related morbidity. Key Message: This study helps to extend the spectrum of immune-mediated complications related to dengue virus by additionally presenting the Miller Fisher syndrome variant, limbic autoimmune encephalitis, immune-mediated cerebellar demyelination, and benign brain stem encephalitis with ocular flutter and opsoclonus myoclonus, as the integral manifestations of dengue virus infection. An early administration of immunomodu therapy in such cases may help to reduce morbidity. Dengue is one of the most recent re-emerging infectious disease not only in India, but also worldwide. Clinical manifestations of dengue virus infection (DENV) have been classified according to their severity by the World Health Organization (WHO) as nonspecific febrile illness, classical dengue syndrome (DF), dengue hemorrhagic fever (DHF), and dengue shock syndrome (DSS). In 2009, the WHO made adjustments in the classification of disease, which resulted in the recognition of two main presentations of dengue infection, referred to as dengue fever with or without warning signs, and severe dengue. Neurological dengue is classified as a form of severe dengue. Recent evidences from different studies suggest that neurological complications are seen in 4.2–13% of all DENV.,, Various studies have hypothetically categorized neurological manifestations associated with dengue virus into: (1) Direct neurotropic complications (DNC) leading to encephalitis and myositis; (2) systemic neurological complications (SNC) or indirect effects due to metabolic complications resulting in encephalopathy, and cerebrovascular complications due to thrombocytopenia as well as platelet dysfunction and hypokalemic paralysis; and (3) immune-mediated neurological complications (IMNC), which include acute disseminated encephalomyelitis (ADEM), Guillain–Barre syndrome (GBS), and opsoclonus myoclonus syndrome (OMS). There is paucity of literature on dengue-related IMNCs. In this study, we focused on the variability in clinical presentations, investigations, and the role of immunomodulation in IMNC associated with DENV. This study was a cross-sectional observational study of 79 patients having IMNC from among 1627 laboratory confirmed DENV cases, seen from January 2015 to January 2016 at the Government Medical College and attached groups of hospitals, Kota, Rajasthan, India, with a follow-up for 3 months. We analyzed the laboratory and clinicoradiological data, as well as the predictors for the development of IMNC, and assessed the outcome after instituting a short-term immunomodulatory therapy (IMT). Informed consent was taken from all the included patients and the local ethical committee of the hospital gave the permission to conduct the study. DENV was diagnosed on the basis of positive detection of the positive serum immunoglobulin M (IgM) antibody and the nonstructural protein 1(NS1) antigen. The serum IgM antibody was analyzed by the enzyme-linked immunosorbent assay (ELISA) method using an IgM antibody capture ELISA (MAC-ELISA, National Institute of Virology, Pune, India). It was a qualitative analysis, and hence, the titers were not measured. The baseline characteristics and the epidemiological data including the age and gender of all the included patients were recorded. The routine laboratory investigations including the hemoglobin level, total leucocyte count, platelet count, hematocrit, random blood sugar, liver function test, renal function test, serum creatine kinase level, prothrombin time, activated partial thromboplastin time, serum electrolytes, and ELISA for human immunodeficiency virus (HIV) were performed in all the patients. Nerve conduction studies (NCS), electromyography, electroencephalography, visual evoked potential (VEP), and neuroimaging studies including the magnetic resonance imaging (MRI) of the brain and spine were performed in the patients, as indicated by their clinical presentation. The cerebrospinal fluid (CSF) analysis, including the estimation of the presence of IgM antibody for dengue virus, was performed in the indicated patients. Serum and CSF samples were also tested for herpes simplex virus (HSV), Mycobacterium tuberculosis, Japanese encephalitis (JE) virus, cytomegalovirus (CMV), human T cell lymphotropic virus type-1 (HTLV-1), Epstein–Barr virus (EBV), and varicella zoster virus (VZV) in patients who presented with acute disseminated encephalomyelitis (ADEM), immune-mediated cerebellar demyelination (IMCD), myelitis, polyneuritis cranialis, and plexitis. Tests for antinuclear antibody, rheumatoid factor, antiphospholipid antibodies (APLA), anti-aquaporin-4 (NMO-Ig; meuromyelitis optica -immunoglobluin G) antibody, anti-ganglioside antibody panel, and N-methyl D- aspartate (NMDA) receptor antibodies were also carried out in the indicated cases to exclude the presence of autoimmune diseases. The latency period for the onset of IMNC was calculated from the abatement of fever. According to this criterion, the patients were classified as having an acute (<7 days), a subacute (7–30 days), and a chronic (>30 days) onset of their IMNC. On the basis of the immunomodulatory therapy (IMT) received, the patients were divided into two categories, i.e., those who received a single IMT [intravenous methylprednisolone (MPS; 1g for 5 days) or intravenous immunoglobulins (IVIg; 0.4 g/kg for 5 days) or plasmapheresis] and those who received a double IMT. The outcome was defined at the end of 3 months follow-up on the basis of the modified Rankin scale (mRS). Complete recovery (CR) and favorable outcome were labeled when mRS ≤2 (i.e., independent for activities of daily living), whereas partial recovery (PR) was determined when mRS ≥3. The mean, range, and standard deviation were calculated wherever applicable. Fisher's exact test was used to calculate whether there was a significant association between categorical variables. The P value was derived from the F-statistic score by making use of the F cumulative distribution function. Chi-square test was used for testing categorical data and dense contingency table. Significance level was considered as P value <0.05. A possible correlation was assessed using Pearson correlation coefficient. The Pearson correlation coefficient was used to measure the strength of a linear association between two variables, where the value r = 1 means a perfect positive correlation and the value r = −1 means a perfect negative correlation. For statistical analysis of all the above data, we used the Statistical Package for the Social Sciences version 17.0 software (SPSS statistics for windows, version 17.0. Chicago: IBM Inc.). Out of the 1627 DENV patients, 1308 (80.39%) were diagnosed with DF, 292 (17.94%) with DHF, and 37 (2.27%) with DSS based on the WHO criteria. 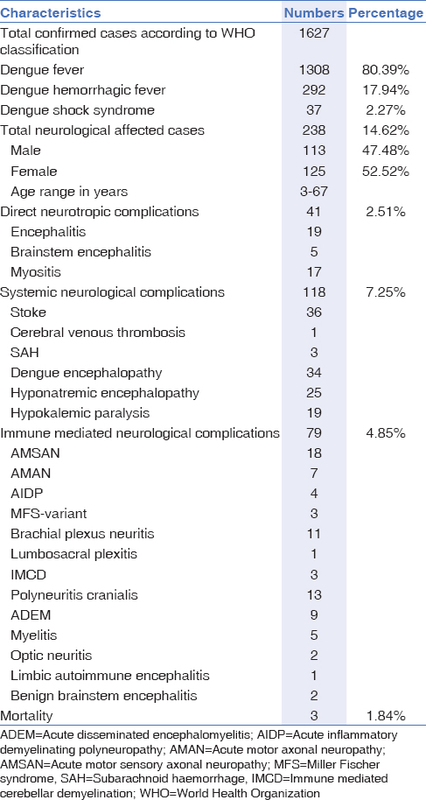 A total of 238 (14.6%) patients developed neurological complications. Out of these 238 cases, 125 were female and 113 were male patients. The mortality in dengue patients having neurological complications was only 3 (1.8%). The mortality was observed only in the SNC and DNC groups with no mortality occurring in the IMNC group. Among the 3 deaths, 2 patients had a clinical diagnosis of DHF with hemorrhagic stroke, and the remaining one was diagnosed as DSS with encephalitis. 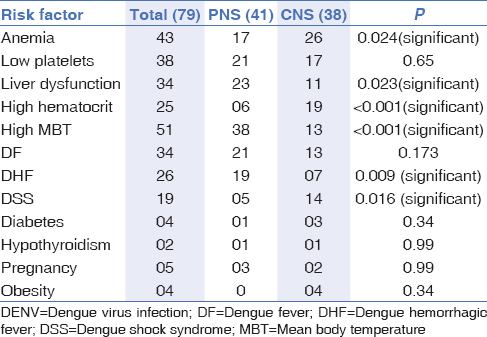 Out of the 238 cases, the most common dengue-related neurological complications were found in the SNC group, which included 118 (7.2%) patients; this was followed in terms of their incidence by the IMNC and the DNC groups, which included 79 (4.86%) and 41 (2.5%) patients, respectively [Table 1]. This study included an analysis of 79 (4.86%) patients who developed IMNC. The mean age of these patients was 31.09 years (range: 3–67 years). Out of the 79 patients, 38 had central nervous system (CNS) and 41 had peripheral nervous system (PNS) involvement. Majority of the cases developed IMNC in the subacute (7–30 days) latency period. The demographic profile and various clinical manifestations of the included patients are mentioned in [Table 2]. In our study, the observed spectrum of IMNC included GBS, MFS, ADEM, myelitis, polyneuritis cranialis, optic neuritis, limbic encephalitis, IMCD, brachial and lumbar plexitis, and benign brainstem encephalitis with saccadic instability (manifesting as opsoclonus myoclonus and ocular flutter). A comparison of the presumed risk factors in patients with CNS versus those with PNS involvement revealed that the significant predictors of CNS involvement were the presence of anemia (P = 0.002), an elevated hematocrit (P = 0.001), and the presence of DSS (P =0.001); whereas, a higher mean body temperature (P = 0.001), the presence of dengue fever (P = 0.002), and an elevated hematocrit (P < 0.001) were more associated with the PNS involvement. Other parameters, i.e., DHF, diabetes, hypothyroidism, and obesity (body mass index >30) were not found to differ significantly between the two groups [Table 3]. The correlation analysis of the various predictors and the development of IMNC revealed that the platelet counts and the hemoglobin levels had a negative correlation, whereas the hematocrit value, the mean body temperature, and the SGPT levels had a moderately significant positive correlation with the development of IMNC. No correlation was observed between the age of the patient or the SGOT levels with the development of IMNC [Table 4]. GBS was observed in 32 cases (40.51%). The mean latency period for the development of GBS was 11.78 ± 7.61 days (mean ± standard deviation [SD]). Neurophysiological study revealed the acute motor and sensory axonal neuropathy (AMSAN) subtype as the most common variety in 18 cases, followed by acute motor axonal neuropathy (AMAN), acute inflammatory demyelinating polyradiculoneuropathy (AIDP), and Miller Fisher syndrome (MFS) [Appendix 1] and [Appendix 2]. Out of the 32 GBS patients, 3 were diagnosed as having MFS (pre- and post-treatment Video 1 and 2, respectively), among which the ganglioside antibody profile (as assessed by the serum immunoblot assay) was positive only in 1 patient for the antiGQ1b ganglioside antibody, whereas the remaining patients were negative for all the antibodies (antiGQ1b, GM1-3, GD1a, GD1b, and GT1b). ADEM was found in 9 patients (11.39%) with a mean latency period of 10.44 ± 5.57 days (mean ± SD). MRI of the brain and cervical spine depicted extensive multifocal predominant white matter lesions on T2-weighted and fluid attenuated inversion recovery (FLAIR) images with involvement of the frontal, parietal, and temporal white matter as well as the corpus callosum [Figure 1]. However, in 3 patients, the brainstem and bilateral thalami were also involved. In the myelitis segment of ADEM, it is worth mentioning that 7 patients had longitudinal extensive transverse myelitis (LETM) with negative anti- neuromyelitis optica (NMO) antibodies. The attainment of complete recovery after a 3-month follow-up in ADEM patients who received methylprednisolone (MPS) was better (87.5%) than those who received other forms of IMT (50%), although the result was statistically insignificant. An isolated IMCD was observed to be a new finding in 3 patients. MRI of the brain of these IMCD patients demonstrated areas of altered signal intensities in bilateral cerebellar white matter, appearing hypointense on T1, and hyperintense on T2 weighted images without any mass effect [Figure 2]. The cerebrospinal fluid (CSF) examination revealed elevated proteins (71 mg%) with normal sugar (58mg%) and cell count (<5/cu.mm.). The CSF examination revealed normal adenosine deaminase (ADA) levels with negative India ink preparation and oligoclonal bands (OCB). To exclude other diagnostic possibilities with a similar kind of cerebellar involvement, relevant investigations, including serum angiotensin converting enzyme (ACE) level; venereal disease laboratory (VDRL) test; tests for varicella zoster virus (VZV), human immunodeficiency virus (HIV) and herpes simplex virus (HSV); anti-nuclear antibody (ANA) level, cytomegalovirus (CMV) level, and anti-thyroperoxidase (TPO) antibodies were also tested. Five patients had only myelitis as a complication of dengue infection. All the patients had more than 3 segment involvement, among which 3 had longitudinal extensive transverse myelitis [LETM] [Figure 3]. The CSF examination did not show any significant changes in cellularity or chemistry. Other investigations, considering the possibilities of inflammatory, infectious and autoimmune LETM were negative, which included anti-NMO antibodies, oligo-clonal bands (OCB), ACE level, tests for VZV, HIV, HSV, ANA, CMV, and anti-TPO antibodies. The functional outcome after 3 months follow-up in 4 patients who received MPS was favorable (mRS <2), whereas it was poor (mRS 3) in 1 patient who was treated with IVIG. One patient of DHF with thrombocytopenia developed limbic encephalitis. The patient, 16 days after the abatement of fever, presented with altered behavior, hallucinations, forgetfulness, and a flurry of complex partial, and generalized tonic-clonic seizures. The MRI revealed a left temporal lobe and hippocampus area T2-weighted and FLAIR hyperintensity without diffusion restriction [Figure 4]. The investigations revealed positive anti N-methyl D-aspartate (NMDA) receptor antibodies in serum along with dengue ELISA test being positive for IgM. Rest of the investigations were normal, including polymerase chain reaction (PCR) for Japanese encephalitis (JE), HSV, and Mycobacterium tuberculosis in the CSF, which were done to exclude other causes of encephalitis and of paraneoplatic etiology. The serum samples were also negative for HIV, Epstein-Barr virus (EBV), and varicella zoster virus (VZV). Antinuclear antibody, rheumatoid factor, and anti-phospholipid antibodies (APLA) estimation to exclude autoimmune diseases were also found negative. She was treated with a 5-day course of MPS followed by the long-term administration of immunosuppressants and had a favorable outcome. However, this could be the case of NMDA positive autoimmune encephalitis or coincidental DENV, which needs to be correlated. The diagnosis of brachial plexus neuritis was also established in 11 (13.92%) patients. Seven of these 11 patients had a right upper limb involvement. The mean latency period was high (18.35 ± 2.01 days, a minimum of 7 days and a maximum of 29 days). The neurophysiological evaluation by stimulation of the proximal nerves of the upper limbs (axillary, musculocutaneous, long thoracic, suprascapular, radial, median, and ulnar) revealed demyelinating changes in 9 patients and axonal abnormality in the remaining 2 patients. One patient had clinical features of unilateral lumbosacral plexitis in the form of neuropathic pain, weakness, and atrophy of proximal musculature in the lower limbs following the dengue infection. The nerve conduction studies (NCS) were suggestive of an axonal pattern. The gadolinium-enhanced MRI dedicated to the lumbosacral spine and plexus was within normal limits; however, CSF showed albumino-cytological dissociation. All patients achieved complete clinical recovery after a course of intravenous MPS. Two patients had isolated painful optic neuritis (retrobulbar type). The latency period was 9 and 13 days in the first and second patient, respectively. The involvement was unilateral with a delayed P-100 latency seen on visual evoked potentials (VEP) and there was no optic disc leakage visible on retinal fluorescein angiography. A brain and orbital MRI study revealed mild enhancement of the optic nerves. After a 5-day course of MPS, complete clinical recovery was achieved after 10 days. Other ophthalmological complications were due to the instability of the extraocular movements related to muscles supplied by the oculomotor nerve, which included ocular flutter and OMS. In addition to oculomotor movement abnormality, they also had brain stem signs (only cerebellar ataxia, dysarthria, and dysphagia) with normal imaging and CSF examination. A clinical possibility of benign brain stem encephalitis was kept because a detailed workup did not reveal any positive etiology [Video 3]. Thirteen patients with isolated cranial nerve involvement, in the background of normal biochemical and radiological investigations and with exclusion of all other possible etiologies, were assigned a clinical diagnosis of polyneuritis cranialis. The most common groups of cranial nerves involved included the VIIth, IIIrd and VIth cranial nerves, followed by the VIIth, IXth and Xth cranial nerves, and then the IIIrd and the VIth cranial nerves. Unilateral involvement was observed in 4 patients, whereas bilateral involvement was seen in 9 patients. Five patients received IVIg whereas 8 received MPS. A significant incidence (P = 0.032) of complete response was observed in the MPS group. Various IMNC were compared in the DF and the severe syndrome groups, the results of which showed that the DF patients had a significantly higher incidence of brachial plexus neuritis (P < 0.05) and polyneuritis cranialis (P < 0.013), whereas the patients belonging to the severe syndrome group were more commonly associated with the AMSAN variant (P < 0.014) of GB syndrome. No significant difference was observed in the other IMNCs in the two groups [Table 5]. On analysis of the immunomodulatory therapy given to the 32 patients of GBS, 29 patients received single IMT (IVIg, plasmapheresis or steroids), whereas the remaining 3 patients, who were diagnosed as having MFS, received two types of IMTs (IVIg and steroids). Out of the 29 GBS patients, 18 patients were treated with either IVIg (n = 14) or plasmapheresis (n = 4). The remaining 11 patients only received steroids, which is not a recommended treatment modality for GBS. The number of patients showing complete response on the follow-up evaluation was 12 (in the IVIg group), 3 (in the plasmapheresis group), and 7 patients (in the steroid group). All 3 patients with MFS, who received both IVIg and steroids, showed a complete response on the follow up evaluation. The percentage of patients who received only a single IMT and showing a complete response was as follows: 85.71% in the IVIg group, 75% in the plasmapheresis group, and 63.63% in the only steroid group [Table 6]. All the included patients, other than those who developed GBS, were also analyzed on the basis of whether they received MPS or IVIG/PLX with the difference in outcome at the end of 3 months follow-up based on the mRS score being evaluated. A total of 34 (43.04%) patients received MPS, and the mean time to start IMT from the onset of dengue fever symptoms was 6 ± 3.1 days. Eleven patients, however, received MPS after 30 days of onset of DF symptoms. 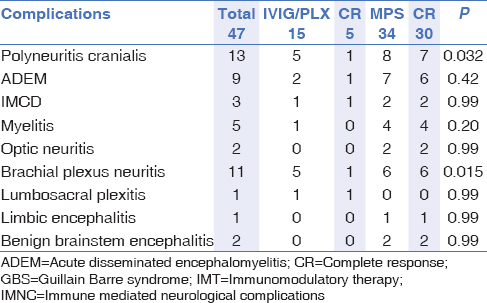 At the end of a follow- up of 3 months, the patients of polyneuritis cranialis and brachial plexus neuritis who received MPS showed a statistically significant clinical improvement compared to those who received IVIG/PLX [Table 7]. There is abundant literature on the spectrum of neurological manifestations associated with dengue fever; however, there is insufficient data on immune-mediated neurological complications because majority of the published articles have not emphasized it. The true incidence and prevalence related to immune-mediated neurological complications associated with dengue virus, as well as their latency period, predictors of neurological involvement, and the consensus on their management has not been clearly mentioned in the literature.,,, During our study, we also encountered different views concerning the immunomodulation treatment, especially regarding the optimal timing for its initiation, the duration of therapy, and whether or not a clinical benefit was expected from it. In this study, we have attempted to answer these questions to some extent. The patients in our study belonged to all age groups, ranging from 3–67 years (mean age: 27 years). Female preponderance in the incidence of IMNC was observed in our study, a finding which was different from that of the previous large cohort studies related to neurological complications associated with dengue infection. In our study, immune-mediated complications were based on biological confirmation; on neurophysiological evaluation in GBS, MFS, as well as brachial, and lumbar plexitis; and, by neuroimaging and/or clinical evaluation in ADEM, myelitis, polyneuritis cranialis, optic neuritis, limbic IMCD, benign brainstem encephalitis with saccadic instability (opsoclonus myoclonus and ocular flutter). Further immune-mediated complications were also endorsed by positive antibody testing in MFS and limbic encephalitis [Appendix 1] and [Appendix 2]. IMNC such as GBS and ADEM can be explained on the basis of autoimmunity, molecular mimicry, or nonspecific activation of auto-reactive T cell clones, leading to the destruction of the myelin sheath antigens. In the last few years, a few case reports of ADEM associated with dengue fever have been reported.,, The autopsy-proven case of ADEM has been mentioned in a case report. This patient had hemorrhagic demyelinating lesions, and the authors explained those lesions on the basis of thrombocytopenia. In our study, 9 (11.39%) patients presented with ADEM with a mean latency period of 10.44 ± 5.57 days. Dengue-related imaging changes in earlier studies were suggestive of extensive multifocal predominant white matter lesions on T2-weighted and FLAIR images, with involvement of the frontal, parietal and temporal white matter as well as the corpus callosum, brain stem, and bilateral thalami.,, According to our observation, no specific strategic pattern for the involvement of brain parenchyma was present; however, in the myelitis segment of ADEM, one point worth a special mention was the presence of longitudinal extensive transverse myelitis (LETM). This finding has also been favored by 5 other cases that had only myelitis pattern with a negative NMO antibody status. The complete recovery following a 3- month follow-up period in patients with ADEM who underwent IMT was better with those who received MPS (6 out of 7; 85.7%) than those who received IVIG (1 out of 2; 50%) patients, although the results were statistically insignificant. The suggested pathological mechanisms for the above-mentioned changes are molecular mimicry or the nonspecific activation of autoreactive T-cell clones leading to a transient autoimmune response toward the development of myelin-oligodendrocyte antigens. This autoimmune response may have hypothetically caused ADEM in dengue infection, just like it occurs in association with many other viruses, bacteria, and plasmodium falciparum. The association of isolated myelitis with dengue virus is exceptional and suggests an acute infectious myelopathy or an immune-mediated process where the virus acts as a “trigger” for the inflammatory processes targeting the myelin sheath cells. In these cases, the spinal cord involvement could represent a partial phenotypic manifestation of post-viral ADEM.,, In DENV, isolated spinal cord tropism was observed in our study in 5 patients, which raised a suspicion of NMO spectrum-like disorder (NMOSD) because all of these patients had more than 3 segment involvement, among whom 3 had LETM. The functional outcome after a 3-month follow-up in 4 patients who received MPS was favorable (mRS ≤ 2); however, it was poor (mRS ≥ 3) in one patient who received IVIG. With our study, we would like to suggest that DENV associated myelitis may be included as a part of the evaluation performed for NMOSD. De Sousa et al., reported a cluster of 26 patients who had myelitis. They did not describe any imaging pattern of involvement; however, they endorsed that the response to IMT was remarkable, which is similar to our observations. A strong argument in favour of the hypothesis of immune-mediated myelitis is the delay in time-period between the end of the fever and the onset of neurological symptoms (mean: 10.8 ± 6.41 days, minimum: 5 days, maximum: 21 days), and the fact that no patient complained of any neurological manifestations during the acute phase of dengue infection. Further, the reversibility of signs and symptoms with intravenous corticosteroid administration is better in the case of immune-mediated myelitis, which is not the case solely in the presence of infectious myelitis. Focusing on the diagnosis, post-infectious myelitis, unlike infectious myelitis, may be associated with a higher frequency of normal CSF. In our study, CSF examination did not show any significant changes in cellularity or chemistry, further reinforcing the hypothesis of an immune mediated mechanism. GBS was observed in 32 (40.51%) patients, the majority of whom had the AMSAN variant. Out of all the GBS patients, 3 cases were diagnosed as probable MFS, a variant which supports the findings of Gaultier et al. Soares et al., discussed 7 cases of GBS associated with dengue-positive IgM antibody in serum, with minimal clinical symptomatology. Similar to the opinion of Soares et al., and other studies, we also endorse that dengue infection should be routinely looked for in cases with GBS in an endemic zone.,,, The percentage of patients, who received only single IMT and showed a complete response were as follows: 85.71% in the IVIg group, 75% in the plasmapheresis group, and 63.63% in the patients receiving only steroids. The above observations support the role of IVIg and plasmapheresis as the first line treatment modality for GBS patients;, however, the patients receiving only steroids also showed a good clinical improvement. One hypothesis as an explanation for this response may be that post-dengue illness, including GBS, may show a good clinical response to steroids, which was observed in other dengue-related IMNCs of this study. However, this hypothesis needs validation by further studies. Brachial neuritis is a neurological disorder characterized by severe neuropathic pain, weakness, and atrophy of the proximal musculature, mainly of the upper limbs, because of involvement of the brachial plexus. The diagnosis of brachial neuritis was also established in 11 (13.92%) patients in our study. Similar finding of brachial plexitis were observed by Verma et al. In that study, the mean latency period was higher (18.35 ± 2.01 days, minimum: 7 days, maximum: 29 days). One patient had clinical features of unilateral lumbosacral plexitis following the dengue infection. Except for the single case having a lumbosacral plexitis, all other patients with brachial plexus neuritis had a demyelinating pattern on nerve conduction studies (NCS). All patients achieved complete clinical recovery after a course of intravenous MPS. We hypothesize that post-dengue infection leads to an autoimmune response against the myelin sheath or against other self-antigens, causing brachial and lumbosacral neuritis due to a patchy demyelination of the plexus, which is similar to the other established virus-induced immune mechanisms. A single patients suffered from dengue-related limbic encephalitis and had positive NMDA receptor antibodies in our study. This may be explained on the basis of the seroconversion by DENV, similar to the earlier hypothesized herpes simplex encephalitis relapse with chorea, associated with autoantibodies to N-methyl-D-aspartate receptor or dopamine-2 receptor reported in one study. However, this hypothesis needs validation by further studies. Various putative mechanisms have been described in the literature. The suggested hypothesis is that dengue infection leads to an autoimmune response against NMDA receptors populated in the limbic areas, which may cause limbic encephalitis. Cranial nerve involvement in DENV has been mentioned earlier in literature. Bilateral cranial nerve involvement associated with DENV had a higher incidence in our study when compared to the earlier published literature., Significant (P = 0.032) complete response to treatment was achieved by administrations of intravenous MPS, followed by a 3-week oral steroid course. Optic neuritis and oculomotor movement instability in benign brain stem encephalitis patients were related to the immune-mediated involvement of the optic nerve and the brain stem controlling centers. A latency period and complete clinical recovery with steroids suggested an immune-mediated involvement, which was also observed by Preechawat et al. Sahu et al., observed the predictors of neurological complications in DENV; similar to the results of that study, our study also endorsed that the significant (P < 0.001) predictors of CNS involvement are anemia, an elevated hematocrit, and the presence of DSS, whereas patients with a higher mean body temperature, DF, and an elevated hematocrit level are more prone for developing the peripheral nervous system involvement. The platelets count and hemoglobin level have a negative correlation, whereas the hematocrit value, mean body temperature, and alanine aminotransferase levels have a moderately significant positive correlation with the development of IMNC. Our observations support the role of IVIg and plasmapheresis as the first-line treatment modality for GBS patients; however, the patients receiving only steroids also showed a good clinical improvement. One hypothesis for this response may be that following the post-dengue illness, including GBS, which in all likelihood is immune-mediated, a good clinical response to steroids is obtained, which has also been observed in other dengue-related IMNCs seen in this study. This is an observational study. The majority of the patients were treated with intravenous methylprednisolone as the primary immunomodulatory therapy. The role of immunomodulatory therapy needs to be further confirmed by large scale randomized control studies. Finally, many treating physicians have been hesitant to give IMT as it has not been studied well, and no consensus exists regarding its administration for this condition. The results of this study may help to extend the spectrum of immune-mediated complications related to dengue virus by presenting newer clinical presentations such as the MFS variant, limbic autoimmune encephalitis, probable IMCD, and benign brain stem encephalitis with ocular flutter and opsoclonus myoclonus. Patients with presumed risk factors and predictors such as a high hematocrit value, liver dysfunction, a high mean body temperature, and the presence of a severe dengue syndrome have a statistically significant tendency to develop IMNC following dengue virus infection. An early administration of IMT in such cases may help to reduce morbidity. World Health Organisation. Dengue haemorrhagic fever; diagnosis, treatment, prevention, and control. Geneva: WHO; 1997. World Health Organisation. Dengue: Guidelines for Diagnosis, Treatment, Prevention and Control. New edition. Geneva, Switzerland: World Health Organisation; 2009. Murthy JM. Neurological complication of dengue infection. Neurol India 2010;58:581 4. Carod Artal FJ, Wichmann O, Farrar J, Gascón J. Neurological complications of dengue virus infection. Lancet Neurol 2013;12:906 19. Jackson ST, Mullings A, Bennett F, Khan C, Gordon Strachan G, Rhoden T. Dengue infection in patients presenting with neurological manifestations in a dengue endemic population. West Indian Med J 2008;57:373 6. Puccioni Sohler M, Rosadas C, Cabral Castro MJ. Neurological complications in dengue infection: A review for clinical practice. Arq Neuropsiquiatr 2013;71:667 71. Ferreira ML, Cavalcanti CG, Coelho CA, Mesquita SD. Neurological manifestations of dengue: Study of 41 cases. Arq Neuropsiquiatr 2005;63:488-93. Sundaram C, Uppin SG, Dakshinamurthy KV, Borghain R. Acute disseminating encephalomyelitis following dengue haemorrhagic fever. Neurol India 2010;58:599-601. Gera C, George U. Acute disseminating encephalomyelitis with haemorrhage following dengue. Neurol India 2010;58:595-6. Brito CA, Sobreira S, Cordeiro MT, Lucena-Silva N. Acute disseminated encephalomyelitis in classic dengue. Rev Soc Bras Med Trop 2007;40:236-8. Yamamoto Y, Takasaki T, Yamada K, Kimura M, Washizaki K, Yoshikawa K, et al. Acute disseminated encephalomyelitis following dengue fever. J Infect Chemother 2002;8:175 7. Kamble R, Peruvamba JN, Kovoor J, Ravishankar S, Kolar BS. Bilateral thalamic involvement in dengue infection. Neurol India 2007;55:418 9. Mathew T, Badachi S, Sarma GR, Nadig R. “Dot sign” in dengue encephalitis. Ann Indian Acad Neurol 2015;18:77 9. 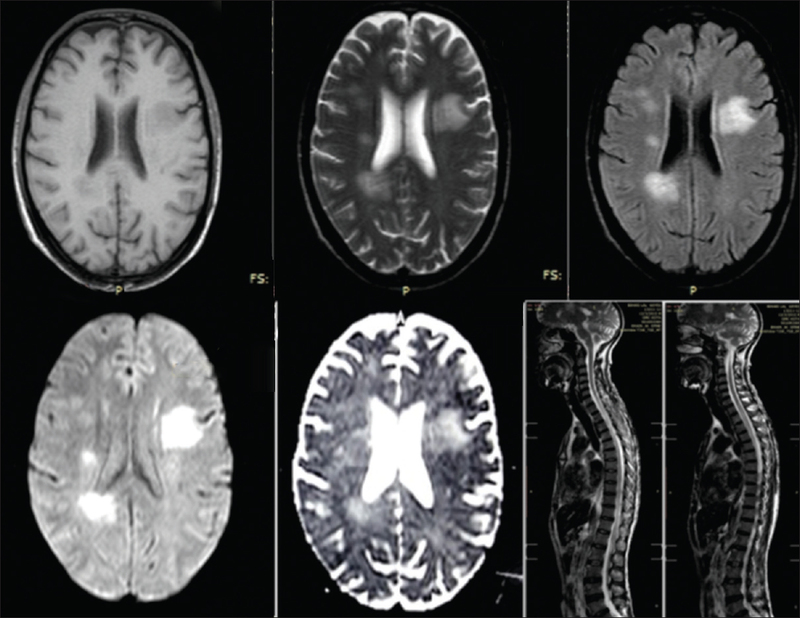 Wasay M, Channa R, Jumani M, Shabbir G, Azeemuddin M, Zafar A. Encephalitis and myelitis associated with dengue viral infection clinical and neuroimaging features. Clin Neurol Neurosurg 2008;110:635 40. Leao RN, Oikawa T, Rosa ES, Yamaki JT, Rodrigues SG, Vasconcelos HB, et al. Isolation of dengue 2 virus from a patient with central nervous system involvement (transverse myelitis). Rev Soc Bras Med Trop 2002;35:401 4. Seet RC, Lim EC, Wilder Smith EP. Acute transverse myelitis following dengue virus infection. J ClinVirol 2006;35:310 2. De Sousa AM, Alvarenga MP, Alvarenga RM. 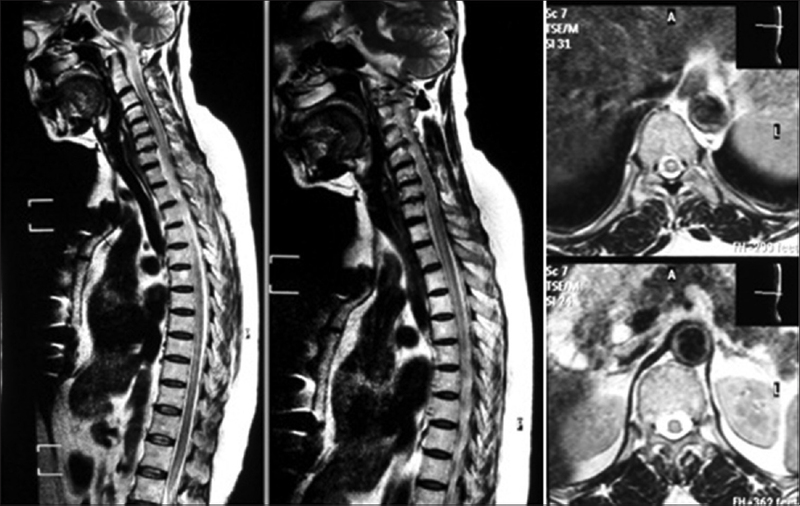 A cluster of transverse myelitis following dengue virus Infection in the Brazilian Amazon Region. Trop Med Health 2014;42:115-20. Gaultier C, Angibaud G, Laille M, Lacassin F. Probable Miller Fisher syndrome during dengue fever type 2. Rev Neurol 2000;156:169-71. Soares CN, Cabral-Castro MJ, Peralta JM, Freitas MR, Puccioni-Sohler M. Oligosymptomatic dengue infection: A potential cause of Guillain Barre syndrome. Arq Neuropsiquiatr2008;66:234-7. Solomon T, Dung NM, Vaughn DW, Kneen R, Thao LT, Raengsakulrach B, et al. Neurological manifestations of dengue infection. Lancet 2000;355:1053 9. Santos NQ, Azoubel AC, Lopes AA, Costa G, Bacellar A. Guillain–Barre syndrome in the course of dengue. Arq Neuropsiquiatr2004;62:144-6. Sulekha C, Kumar S, Philip J. Guillain–Barre syndrome following dengue fever. Indian Paediatr 2004,41:948-50. Chaudhary R, Gupta BS, Gupta R, Garg A, Khedar RS. 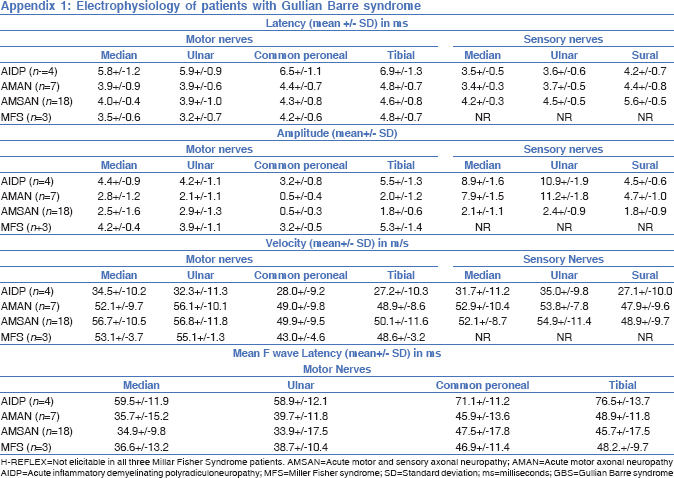 Guillain–Barre syndrome: An unusual complication of dengue fever. Sch J Med Case Rep 2014;2:133-5. Saini L, Chakrabarty B, Pastel H, Israni A, Kumar A, Gulati S. Dengue fever triggering hemiconvulsion hemiplegia epilepsy in a child. Neurol India 2017;65:636-8. Sivamani K, Dhir V, Singh S, Sharma A. Diagnostic dilemma—dengue or Japanese encephalitis?. Neurol India 2017;65:105-7. Verma R, Sharma P, Garg RK, Atam V, Singh MK, Mehrotra HS. Neurological complications of dengue fever: Experience from a tertiary center of North India. Ann Indian Acad Neurol 2011;14:272 8. Preechawat P, Poonyathalang A. Bilateral optic neuritis after dengue viral infection. J Neuroophthalmol 2005;25:51-2. Withana M, Rodrigo C, Chang T, Karunanayake P, Rajapakse S. Dengue fever presenting with acute cerebellitis: A case report. BMC Res Notes 2014;7:125. Weeratunga PN, Caldera HP, Gooneratne IK, Gamage R, Perera WS, Ranasinghe GV, et al. Spontaneously resolving cerebellar syndrome as a sequelae of dengue viral infection: A case series from Sri Lanka. Pract Neurol 2014:14:176-8. Mohammad SS, Sinclair K, Pillai S, Merheb V, Aumann TD, Gill D, et al. Herpes simplex encephalitis relapse with chorea is associated with autoantibodies to N-Methyl-D-aspartate receptor or dopamine-2 receptor. Mov Disord 2014;29:117-22. Sahu R, Verma R, Jain A, Garg RK, Singh MK, Malhotra HS, et al. 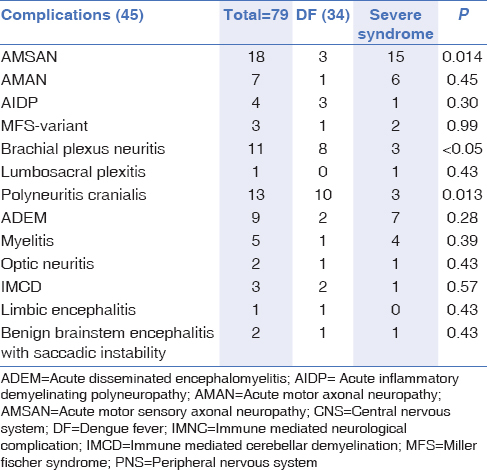 Neurologic complications in dengue virus infection: A prospective cohort study. Neurology 2014;83:1601-9.